Several months back the director of the GreenHill Center for NC Art in Greensboro, NC, had stopped by my studio at Golden Belt in Durham. Subsequently, I was invited as one of about 120 artists from North Carolina for the annual Winter Show at the GreenHill. The Winter Show is the gallery’s fundraiser with a big gala for art collectors and exhibiting artists. Edie Carpenter, the director of the GreenHill, called me with her choices of my work for the exhibition: 2 pieces from the Stillness series and one Lavender Field. Unfortunately, I just sold my last Lavender Field and they were mainly small pieces anyway. She really wanted a lavender field. I’m sorry, I sold them all. She REALLY wanted a lavender field. My sales record for lavender fields shows that this would be the perfect piece for the exhibition. So I agreed to make a lavender field. “And make it big” Edie said. I chose to make it about 36″ x 48″ and there is a lot of lavender color and purple. Most of my abstract landscapes have horizontal lines pieced from small pieces of fabric after free-form cutting (without a ruler). The lavender fields however, have oblique lines to show the rows of lavender plants. Typically, I design my work intuitively. The lavender fields require more planning though as the lines need to meet in a vanishing point to give the sense of perspective. Having the lines meet in close vicinity also means that there are several seam allowances bunching up close together. The entire process is more time consuming compared to horizontal lines only. 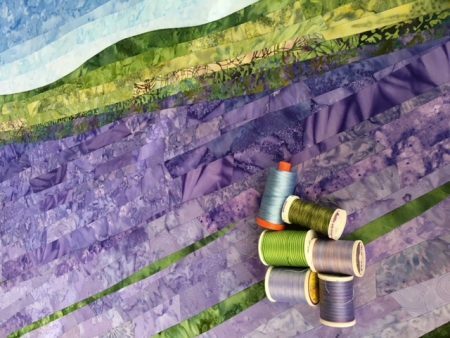 This art quilt is my 8th Lavender Field. Instead of making them all copies from each other I try to make them all somewhat different. After all, I want my art be unique, one-of-a-kind. I hope that this Lavender Field – like the other ones before it – will find a new home and bring joy to the art enthusiast. It is certainly a great honor for me to be selected for the exhibition at the GreenHill and have my work exposed to art collectors in a new location. Life is good!